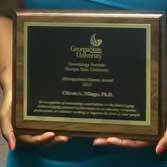 CETL helps coordinate university-wide Faculty teaching awards. Grants are currently available related to creating Signature Experience courses. Additionally, faculty can apply for a Governor’s Teaching Fellowship and the USG Scholarship of Teaching and Learning Fellowship.